Salem, VA (January 20, 2012) - The Boston Red Sox and Salem Red Sox have announced the 2012 Salem Red Sox field and training staff. The Salem Red Sox welcome a new manager, hitting coach, and athletic trainer for the franchise's fourth year as a Boston affiliate. 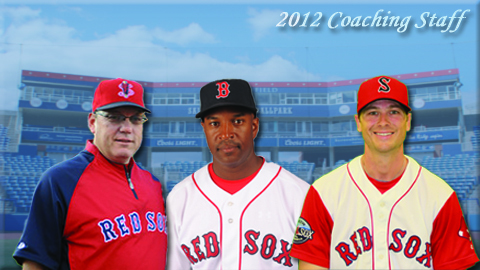 Billy McMillon has been named the Salem Red Sox manager for the 2012 season, while Rich Gedman and David Herrera come to Salem to serve as hitting coach and athletic trainer, respectively. All three coaches on staff are former Major League players. McMillon will serve as Salem's manager after serving in the same capacity for Greenville from 2010-11. He led the Drive to the South Atlantic League Championship Series in his 2010 managerial debut. A Clemson University alum, McMillon played in the Major Leagues from 1996-2004 with the Florida Marlins, Philadelphia Phillies, Oakland Athletics, and Detroit Tigers. Gedman joins Salem after serving last season as hitting coach for Lowell in his first coaching position in affiliated ball. Gedman, a Worcester, Massachusetts native, played for the Boston Red Sox from 1980-1990 and was a two-time All-Star selection (1985, 1986). Kevin Walker, a sixth round selection in 1995 by the San Diego Padres, rejoins the team entering his fourth consecutive year as a minor league pitching coach for the Boston organization (Greenville, 2010 and Lowell, 2009). In 2009, Walker oversaw a Lowell Spinners pitching staff that posted a franchise-record 2.96 ERA. Herrera will join Salem as Athletic Trainer for the 2012 season from Greenville, where he was the Drive's athletic trainer from 2010-11. He also held that position for Lowell (2009) and the GCL Red Sox (2008). The Salem Red Sox will open the season in Frederick, MD against the Keys on Friday, April 6 before returning a week later for their home opener on Friday, April 13 at 7:05.